A friend, driving from south to north of the island last Sunday, Palm Sunday, the first day of Semana Santa (Holy Week) was held up no less than four times on her journey by processions. In a tourist paradise famous for nightlife and debauchery you might think that religion had died, but truth is that the nightlife and debauchery scene is by far the smaller part of island life, and traditional religious celebrations are by far the larger, even though some these days eschew the machinations of the Catholic Church. Many fiestas have become crowd-pullers in recent years, especially those in villages close to the tourist hotspots of the south-west, it’s reported that over 20,000 watch the annual bathing and blessing of animals in La Caleta on the January fiesta of San Sebastian, and over 30,000 were expected to visit Adeje for this year’s PassionPlay. Islanders are, rightly, proud of their traditions, but it’s hard to guess whether the traditions would survive without the Church (most of them being based on some religious observance), or whether it’s the Church which benefits from the maintaining of the traditions. 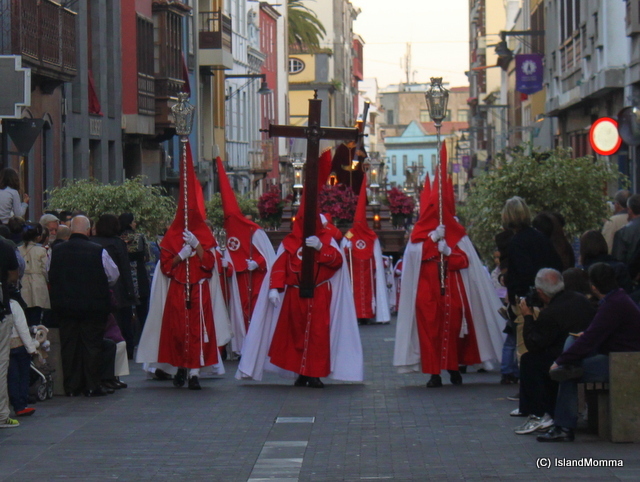 In the case of Semana Santa it’s more clear-cut. This is a religious festival, and a surprising number of folk wholeheartedly believe in it. There remains, of course, the question of whether the lesson (which Jesus preached and to emphasise which he died) is learned or whether it has become the very idolatry against which he railed. Adeje’s Passion Play I find moving, and something resembling a genuine expression of remorse and sorrow, and a hope for renewal. 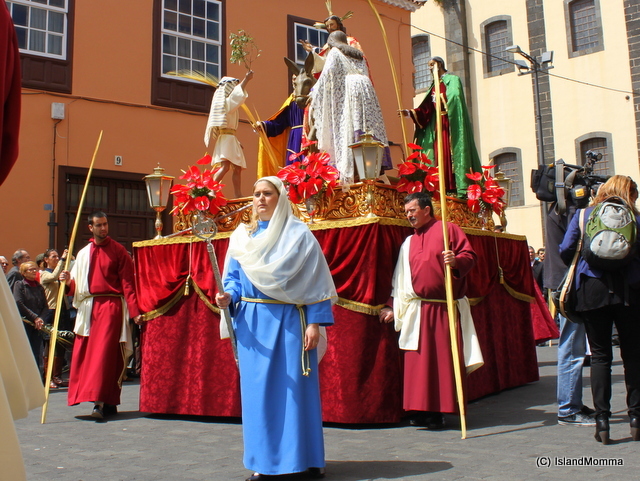 But I’ve long-wondered, having lived many years in Spain now, how I would feel about the more traditional ways of marking the season, so this year I took myself to La Laguna on Palm Sunday. I found it charming, and was surprised to find that it reminded me of the Salvation Army walks of witness to which my grandmother had taken me when I was a very young. I arrived early, and had a quiet shuffle around the always immaculate streets of this World Heritage Site. 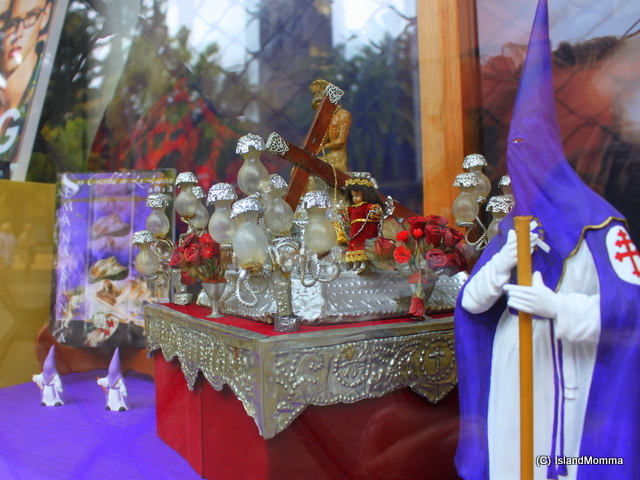 No fluffy bunnies and chocolate eggs in shop windows here, but figures showing members of the different brotherhoods, or cofradía, who would take pride of place in the week’s events. I took coffee in a pavement café opposite an entrance to the Church of the Conception. 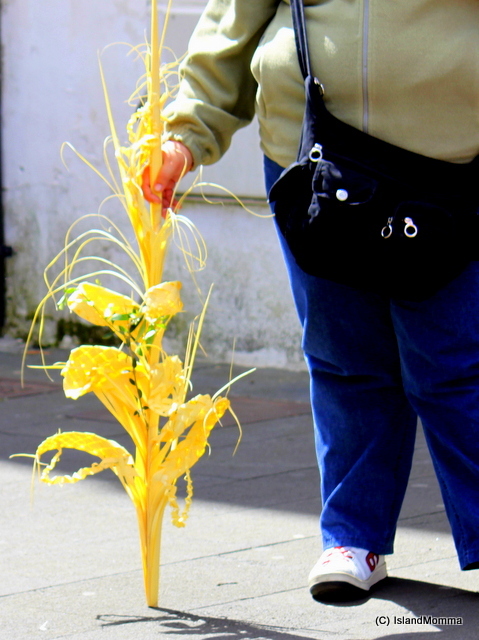 Folk in La Laguna, mostly, dress more formally than in the warmer south of the island, and groups and couples in Sunday best strolled around the area, many carrying elaborately woven decorations made from dried palm leaves (there had been a workshop in a town square the previous day on how to make them), and others carrying simply a branch or strip of palm. Dignatories arrived, and I understand that palms were blessed inside the church, people came and went, tourists stopped and snapped (the tower of this church set against a mountain backdrop is super-photogenic). I left the café and leaned against the church wall for a while, making myself invisible. 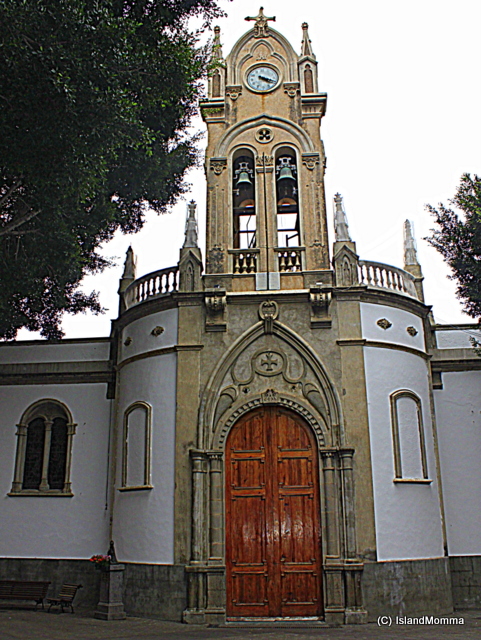 I watched as folk both ordinary and elegant entered and exited the church. By the door sat an old lady, her hand out, begging. The only one to acknowledge her was a boy who looked to be about 12 years old. He asked his father for money, and went back to give it to her. 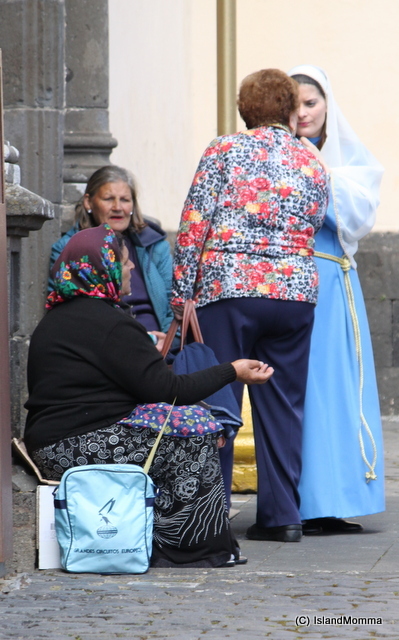 Now, I’m reasonably confident that the woman was a professional beggar, probably not Spanish, and I too ignore them when I see them in Los Cristianos, where they are often found on the tourist streets. It’s the usual story, organized gangs, who shouldn’t be encouraged. Yet, I wondered, were all of these dozens and dozens of people aware of that? I thought it spoke volumes for the young man who gave, regardless of who or what the woman was. I hope he had a happy Easter because that was the one moment of the entire week when I witnessed anything approaching the meaning of Jesus’s teachings. 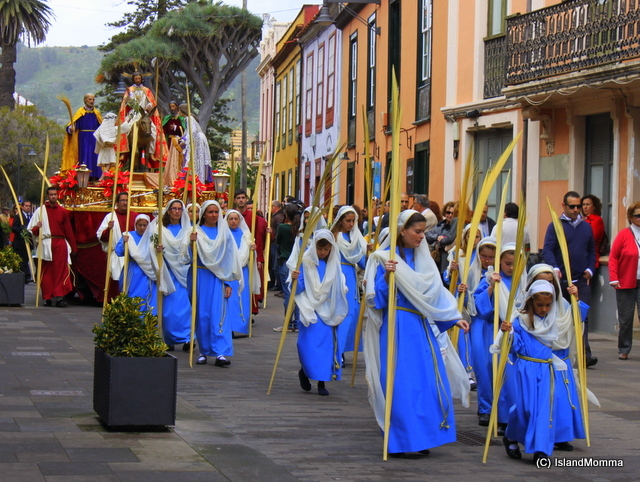 The procession, when it left the church to wind its way around La Laguna’s lovely, old streets was ornate, and like an amalgamation of all the smaller processions I see around the island on a regular basis celebrating individual saint’s days. 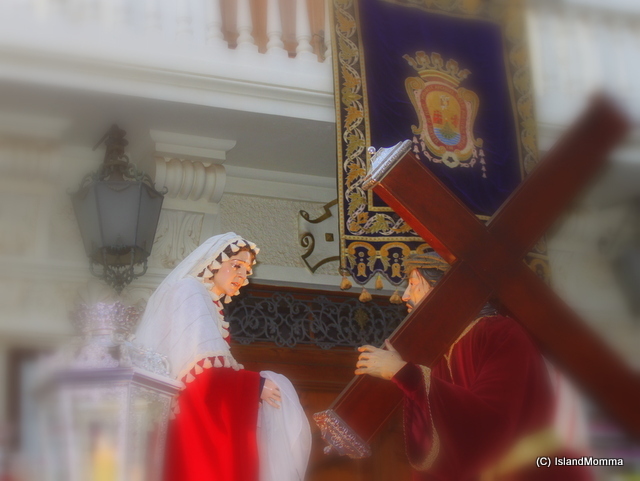 A few folk crossed themselves as the tableau depicting the arrival of Jesus on a donkey approached, but there was none of the weeping I’d sometimes seen, nor cries of “Viva.” It was fairly muted, and compared to La Laguna’s romeria far less well-attended. 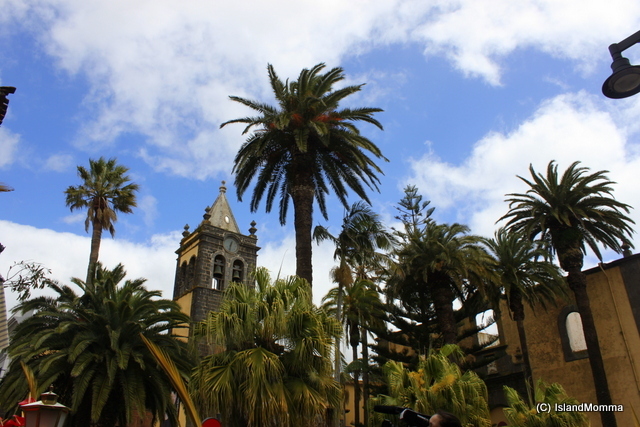 La Laguna is a city, but a country-fied city, sitting in the middle of super-fertile land, and I had expected something grander. Not that I was disappointed, ostentation and finery sit uneasily with me, and the gold-trimmed robes were quite sufficient to the occasion. 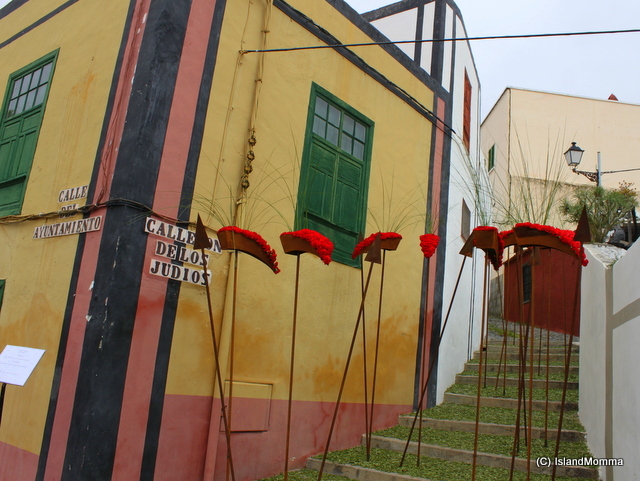 On Thursday I cajoled some girlfriends into coming up to the village of Guia de Isora on the other side of the island to see its renowned displays of floral art. 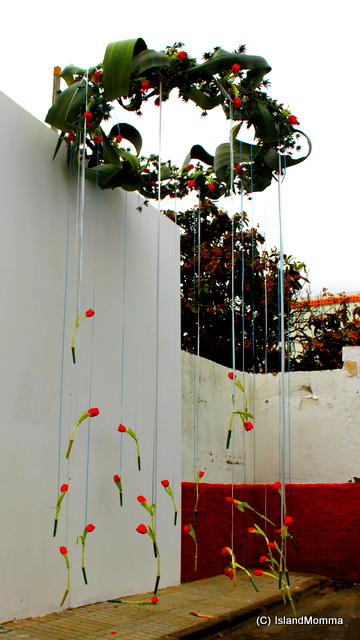 They were pretty, arty, or symbolic in turn; and most shouted “Spring” at me, rather than “Easter”. I guess that’s because they were flowers, and flowers have been on my mind a lot lately. We didn’t go to a service or procession but had a gentle amble around delightfully quiet, narrow streets (traffic had been banned for the duration. Inspired by the Virgin Mary when she met Jesus after he rose from the dead. 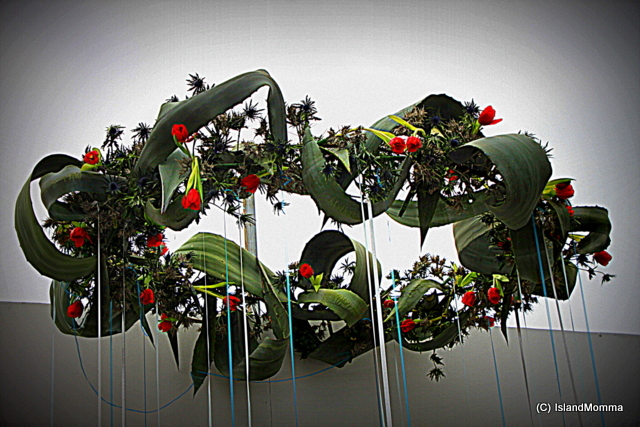 The area around the graceful church square had become an open-air art gallery…..this is, you see, the thing I love about this climate – that a place can with such certainty put on an outdoor display like this, knowing the chances of it being spoiled by bad weather are slight, even though Easter is early this year. I’m not saying it never happens, tragically, on an Easter some years ago, heavy rains and floods in Santa Cruz resulted in death and a lot of property damage, though, here, in the south, it remained quite balmy. We retired to a cosy bar at the end of our stroll and nibbled traditional tapas, pimientos padrón, churros de pescado, whitebait and fresh goat’s cheese. A tranquil afternoon which resembled a tour around an art gallery more than anything Easter-ified, although perhaps that was because of the hour we chose to visit, and that was fine in my book. 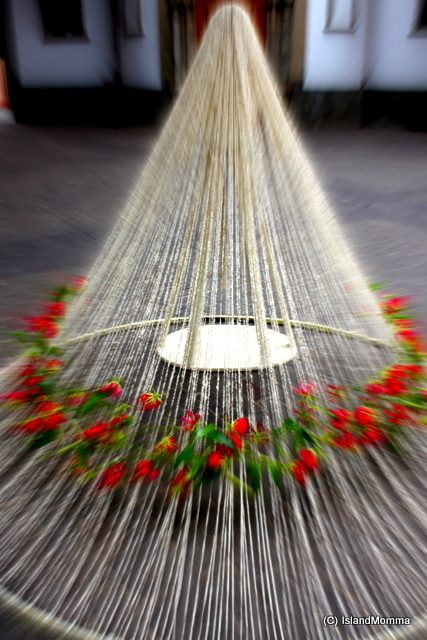 This floral art represents the Roman soldiers who were sent to arrest Jesus. Ironically it stands on the Street of the Jews. Good Friday was an event of a different hue entirely. As a child of the 60s, when I see those conical hats, masking the faces of the brotherhoods who dominate the day’s celebrations I feel a chill. Burning crosses and lynchings immediately spring to mind, and that is sad, because I have repeatedly been told over the years (and even today searched the internet again) that there is no connection between these groups and the infamous Ku Klux Klan. The best guess seems to be that possibly the original Klan thought these garments were kind of cool and copied them. Of course, they wished to hide their identity for entirely different reasons. 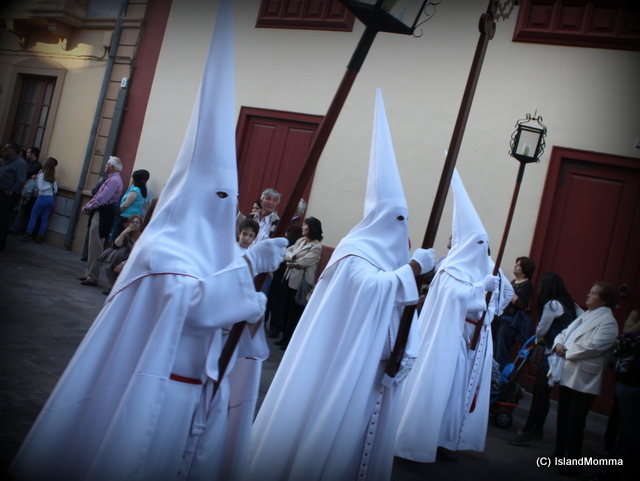 The Catholic cofradías (brotherhoods) hid their faces so they can repent of sins without, in theory, public shame, each group has its own markings and color scheme. The origin goes back to the Inquisition. The Klan did it to escape prosecution. I doubt they felt shame. Even without that connection, though, I am not sure how I am going to feel. I have a strong dislike of secret societies of all kinds. 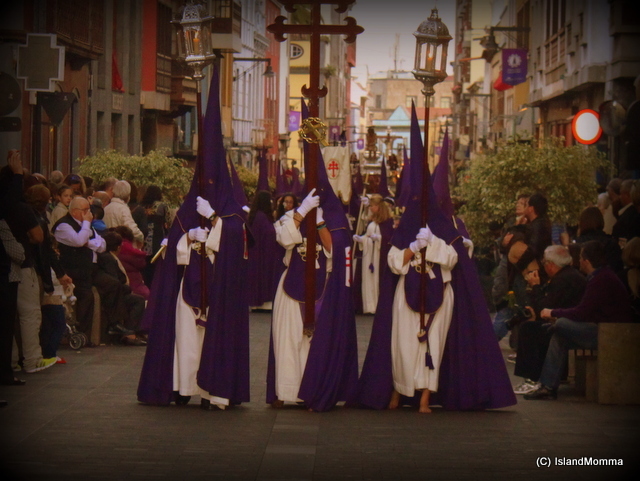 I arrived, with friends, just as the long procession, the Procesión Magna was beginning something after 5pm. The streets which had been unadorned on Sunday now had religious hangings from almost every upper storey window and lamppost, and the area around La Iglesia de la Concepción was milling with people, both hooded and normal gawpers like ourselves. We found a place to watch quite comfortably on the first street along which it passes, which surprised me. With the sun getting low in the sky the narrow street was dappled, half in sunshine, half in shade. The mood, if not festive, wasn’t as sombre as I’d expected either, though voices were low, people were chatting and children fooling around. As the first group of cofradía approached the noise level dropped a tad, and one or two people crossed themselves as the first tableau began to pass our spot. As the minutes ticked by I became accustomed to the steady drum beat of the different bands as they passed, the swish of the robes, and the evocative smell of incense, which was waved, usually by children, very enthusiastically at the beginning (I noted the enthusiasm waned as the evening wore on), and I found nothing threatening or frightening in the appearance of the almost ghostly figures as they passed. The first statues were impressive but I’d “seen it all before,” and, yes, I find the opulence hard to take, so I switch into neutral, fly-on-the-wall mode. After a short time the statues changed from mere figures to tableau depicting different scenes from the Easter story, and whatever ones feelings about religion or the Catholic Church in particular one had to admit that some were beautiful works of art, and, of course, spare a thought for the poor costaleros who shoulder these massive masterpieces for the hours it takes this long procession to weave its way around the streets of Tenerife’s ancient capital. They have to be both fit and dedicated, and you have to figure that there is something in this dedication. 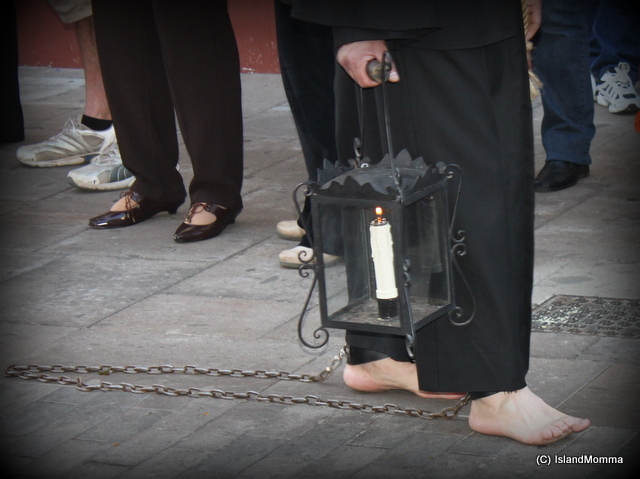 Many of the penitents walk barefoot, and some with ankles chained. As some groups passed the silence was almost tangible. This procession, although the longest of the day, hadn’t been the first, thinking about how my feet some times feel after a hike it occurred to me that perhaps barefoot was a better option! Looking along the street to the starting point by the church it looked as if this procession was endless. Pointed hats, candles and statues filled the horizon as dusk fell. At some point we ducked over to the next street to catch the parade on its return to the church, to find we had arrived at exactly the same point as the first time so long was it. 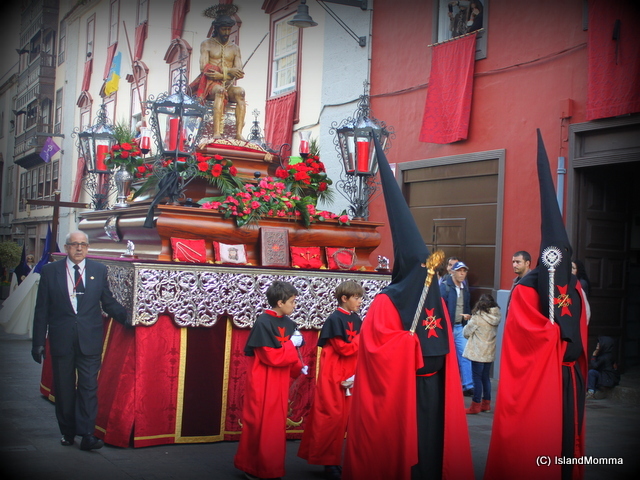 The most overwhelmingly atmospheric procession, however, begins around 9.30 La Procesión del Silencio. We just have time to grab a sandwich and a glass of wine in a very busy bar close to the church, but I imagine that some of the participants went directly from one to the other. 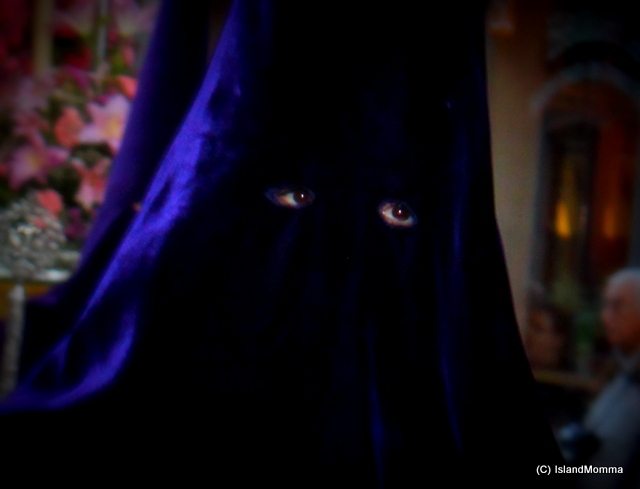 As the name suggests, the procession takes place in utter silence. The lights of the streets and side streets are extinguished so that it takes a while for your eyes to adjust as you pick your way back to find a place to watch in reasonable comfort. Maybe it’s the dark, but there seem to be more people. There is a low rumble of whispered conversation, and I think that perhaps it won’t live up to its name, but as the eerie column of figures approaches total silence falls over the street. There is no music. There are no tableau. The only light comes from the candles held by the walkers. The only sound is the sound of their feet as they pass; sometimes the grating of chains on the stone street; sometimes the heavy, rhythmic tramp a they mark time with each step. It makes them sway in stately unison. Now, yes, it does seem a little sinister. Not a child cries. It feels as if the world is holding its breath, waiting. Only one cellphone rings, and it is rapidly stopped. A woman coughs from time to time. In the far distance a motorbike, but no other traffic sounds at all. I have the childish urge to laugh, and yet, at the same time I respect how the crowd is feeling. It is made up of all ages and types. This is by no means the province of the elderly. Taking photos would be almost impossible, given the numbers of people and the darkness, so I don’t even try. I lean back against a wall, and try to absorb the atmosphere. In the dark it is impossible to tell how long it will take to pass, but fairly quickly there is the faintest hum from the direction of the church. It has passed there, and people are beginning to move quietly away. The only statue, the body of the fallen Jesus passes, and then 3 priests, one of whom I think is the Bishop of Tenerife, and the shadows disappear into the darkness, just the points of light of the candles they carry visible. This group will now crowd into the small church at the end of the route, apparently packed like the proverbial sardines, and homage will be paid, and vigils will be kept until the Rising of Jesus from the dead is celebrated in three days time. Treading carefully down an unlit side street, occasionally bumping into people, we make our way back to the church square, where the lights seem over-bright. Folk are chatting in the curbside bars, and a fine trade in cotton candy and nuts is going on. It isn’t exactly the jolly atmosphere of most fiestas, but it is cosy and friendly. The sense of community is palpable, and, in the end, I think, that is the function of a church, the keeping together of a community, the provision of a sense of belonging. It’s what most people need. This is it for me, though. I’ve had enough of the pomp and the ritual without true meaning. I am told that each Easter a collection of food is made for those in need, and this year there are so many more in need. People are invited to leave suitable foods at a point near the church. This year the gifts were less than ever. Yet there was money for new robes for penitents, and hundreds of flowers to decorate those tableau tonight; money for brocade to drape around statues, money for candles and fresh, white gloves for band members. As my friend, Cristina, said, if every one of those participating in this theater had given just one euro, or one kilo of rice, how much that would have helped those in need. How much more would that have reflected the Easter message? 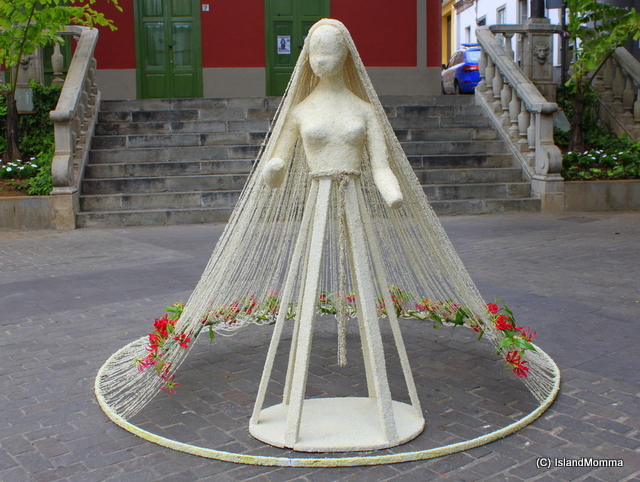 Categories: Canary Islands | Tags: domingo de ramos, easter, easter flowers in guia de isora, easter in Tenerife, floral art in guia de isora, guia de isora, holy week, holy week on Tenerife, la laguna, palm sunday, procesión del silencio, procesión magna, san cristóbal de la laguna, semana santa, semana santa in tenerife | Permalink.